Fat gaper with retracted siphons protruding and the dark periostracum still partially present. Photos by Jessica Brown. The shell of the fat gaper is a chalky white colour; the periostracum, where present, is dark brown or black. 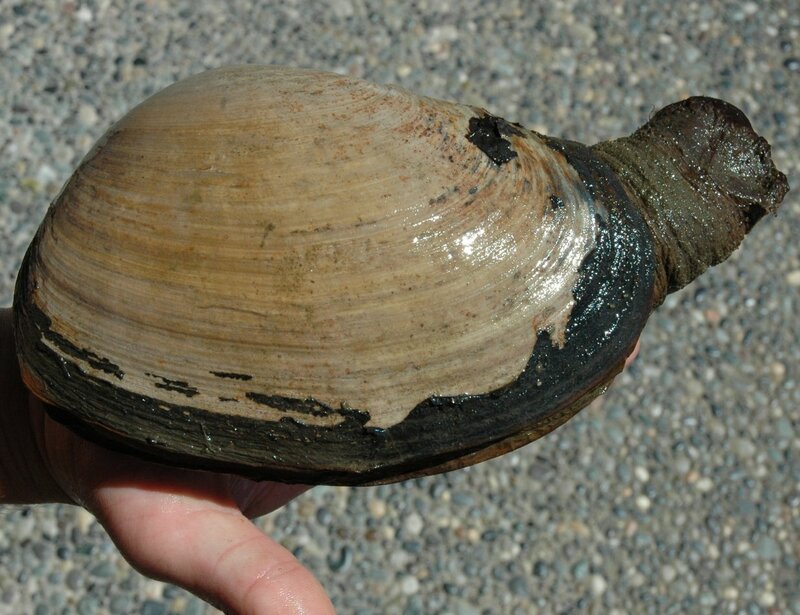 The length of the oval-shaped shell is about 1.5 times the height (click here for information on shell orientation). The shell valves form a large gape at one end from which the long siphons protrude. When retracted the siphons, which can be as long as the shell, still extend out of the shell gape. The shell length is often more than 10 cm and can be up to 28 cm. 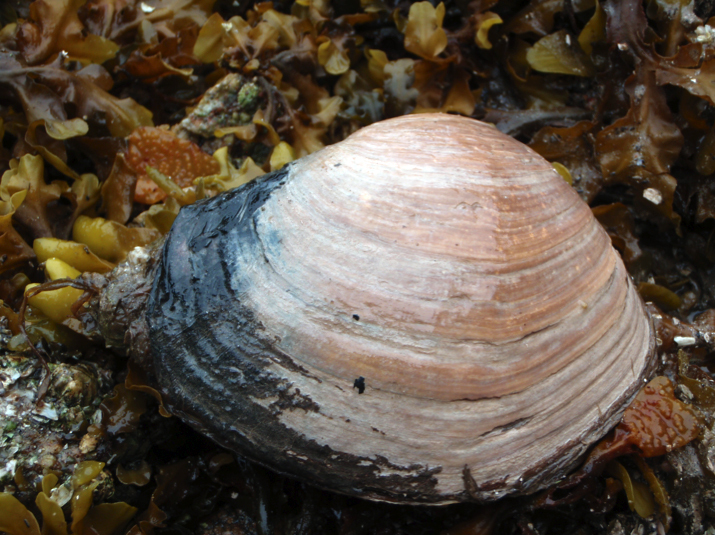 See the Rosario Beach Marine Laboratory species page for detailed information on shell identification. The fat gaper can be found buried up to 1 m deep in more compact sand-mud, mud, and clay substrates. It inhabits the intertidal and subtidal of quiet, sheltered locations to a depth of 30 m. Its range extends from the Gulf of Alaska to southern California, though it is more common at the north of its range. The Pacific gaper (Tresus nuttallii) is usually longer relative to its height. Unlike the Pacific gaper, the fat gaper usually hosts pea crabs in its mantle. The Pacific gaper has thick leathery plates at it siphon tips. 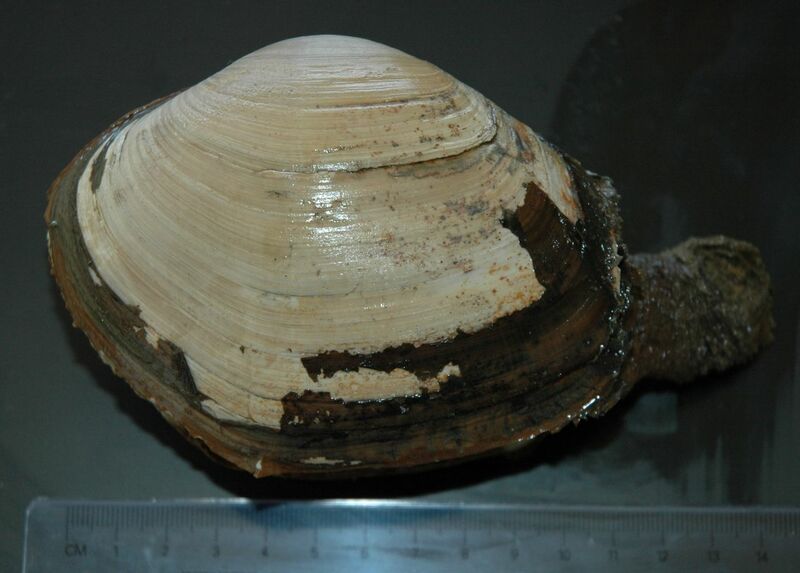 Because of its large size, the fat gaper may also be mistaken for the Pacific geoduck (Panopea abrupta), which is even larger with shell valves that gape at all sides. The fat gaper is harvested recreationally and commercially. Cowles, D. (2005). Tresus capax (Gould, 1850). Invertebrates of the Salish Sea. Rosario Beach Marine Laboratory. Accessed 08/12/2014. Harbo, R. M. (1999). 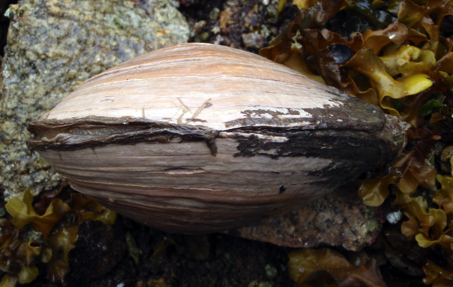 Whelks to whales: Coastal marine life of the Pacific Northwest [revised]. Madeira Park, BC: Harbour Publishing. P. 126.